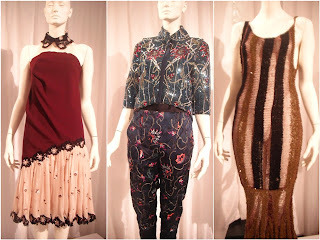 I recently attended Swarovski's Autumn/Winter '12-13 press day at the stunning Il Bottaccio in London. There were so many beautiful sparkling jewels on show! One of my highlights was seeing a selection of designer pieces on display that feature Swarovski crystal detailing hot off the catwalks from the recent autumn/winter fashion weeks. 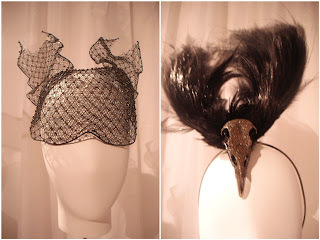 Eagle Skull Feathered Headdress by Philip Treacy and jewellery designer Shaun Leane for Alexander McQueen. 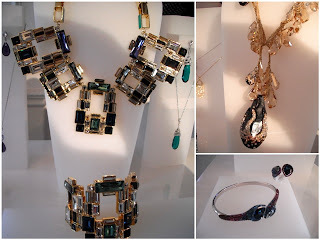 I also loved seeing the new Atelier Swarovski jewellery collections designed by a selection of top designers from across the globe. 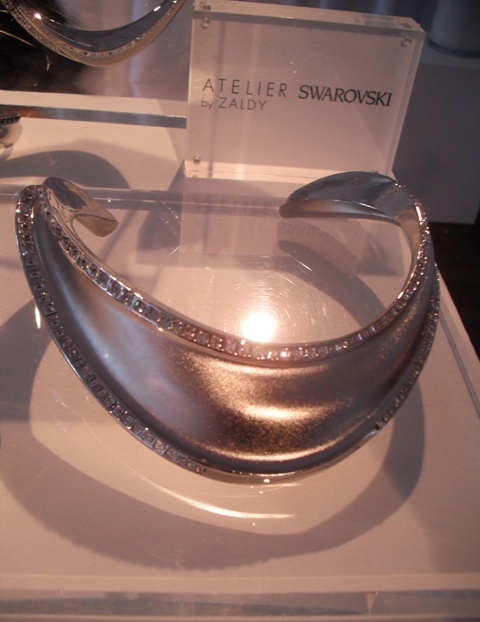 This silver crystal necklace is by New York costume designer Zaldy who has created stage wear for Lady Gaga, Gwen Stefani and Michael Jackson. Christopher Kane has updated his Atelier Swarovski jewellery collection for the season with glistening black and bronze crystal chokers. 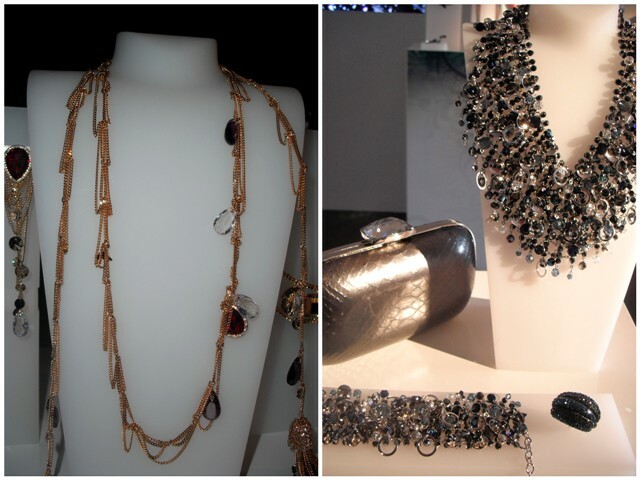 The Swarovski Crystallized collection features designer jewellery. Their autumn/winter 2012-13 collection reflects the season's catwalk trend for bold statement jewellery. Rodrigo Otazu's'Gala' necklace displays eye catching blue Swarovski crystals against a cascading gold statement necklace. The 'Gala' design is also available as a cuff bracelet. 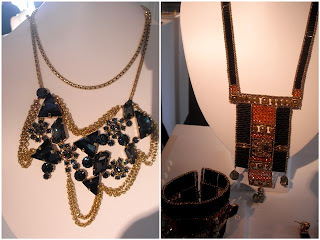 Caleidoscopio's 'Ouro Preto' necklace and bracelet have an Egyptian vibe. Swarovski crystals glisten in their geometric design. Marmen's 'Cosmic Chic' necklace is one of my favourite designs. It caught my eye right away! Large crystals sparkle against leather on this statement necklace with a silver chain. Gian Paolo Maria's necklace is part of the 'Dawn' collection. The draped design looks elegant and effortlessly stylish. Matching earrings, a bracelet and ring are available. Swarovski's Hello Kitty Rocks collection comprises Hello Kitty crystal pendants, leather bracelets with stud and crystal detailing, charm bracelets and card holders and bags. There's also a special Christmas collection. 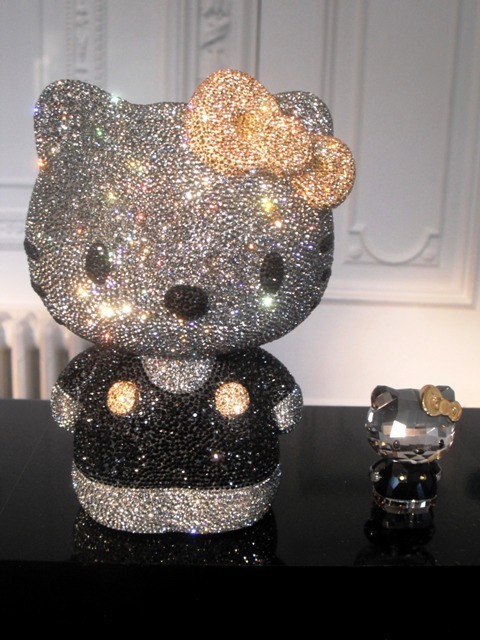 This fabulous large limited edition crystal Hello Kitty features individually placed diamonds and is one of only four available in the UK. It retails at £6,000. I'd better start saving! Swarovski also offers a range of stylish leather goods adorned with crystals including iPhone and iPad cases as well as card holders and purses. Swarovski's Disney Autumn/Winter collection for 2012-13 features Tinker Bell. The magical fairy appears on a range of pendants and bracelets. 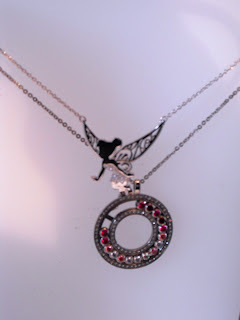 There's also a gorgeous silver Tinker Bell wings ring. 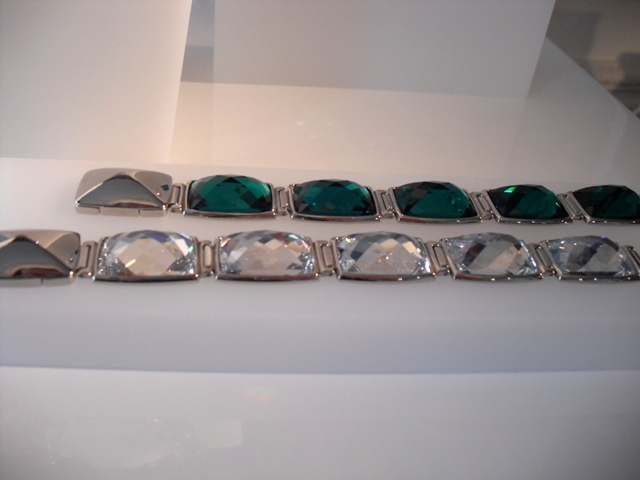 I loved the jade and clear crystal bracelets from the Nirvana collection which features Swarovski cut crystals in a range of jewellery settings including pendants, earrings, cuff bracelets and rings. The 'Standing' necklace and cuff comprise a range of coloured crystals. 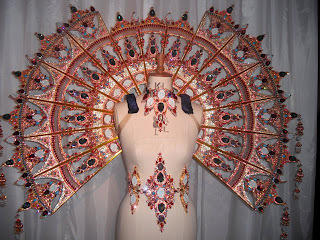 The design has an art deco feel. The 'Sketch' pendant necklace has smaller gold and silver crystals emblazed over a larger black crystal pendant. Crystals also adorn the chain. The colourful Snake bangle is designed in celebration of the Chinese year of the snake. The snake design is also available as a necklace and ring. The 'Singapour' Scarf necklace has an oriental look with bright red and amethyst coloured crystals mixed with the gold chain. The scarf necklace can be worn layered and also as a belt. The 'Suddenly' necklace and bracelet feature dainty blue crystals and make the perfect eye catching statement set. 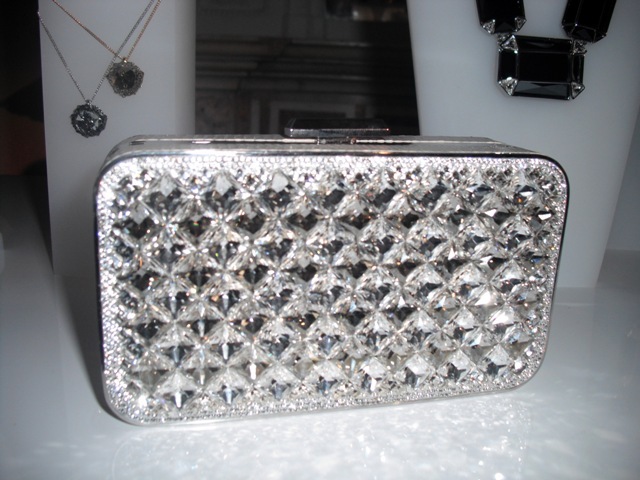 Swarovski design a range of sparkling crystal clutches and purses that are often snapped on the arms of A list stars at red carpet events. This stunning crystal clutch would make the ideal party bag... a girl can dream! Swarovski's opulent crystal jewellery makes fabulous presents. There's also lots of budget friendly options even in their designer collections! Wow its a bling overload - I think the simple Jade bracelet is my favourite. It is so chic and elegant. Unbelievably jealous you are going to all these press days! 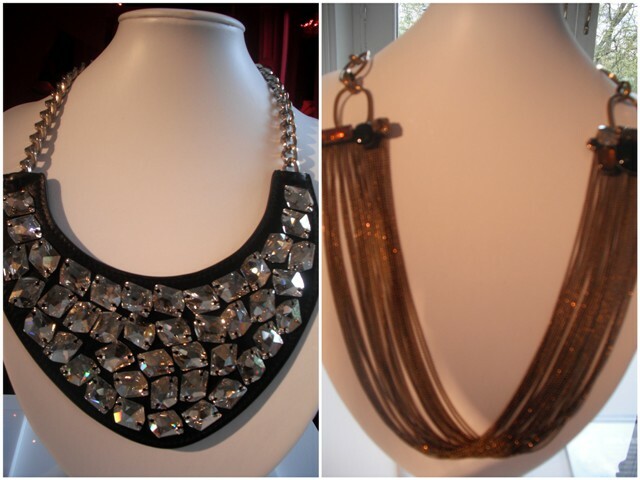 All the collar necklaces are just heaven. I want them all. The Marmen, Gian, Zaldy. I'd wear them all the time. 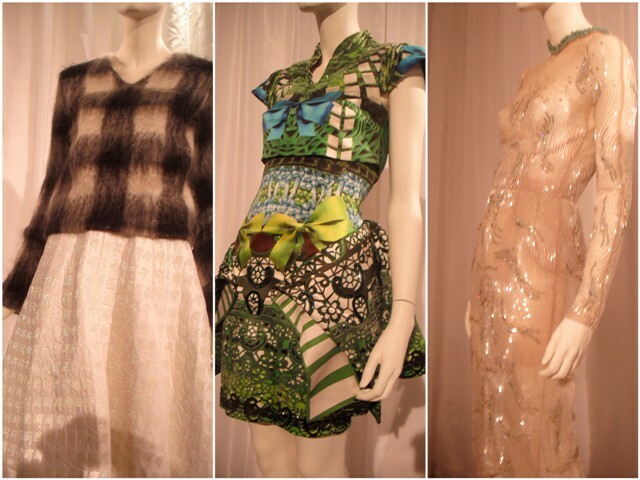 And the Mario Shwab dress would compliment them all very nicely! 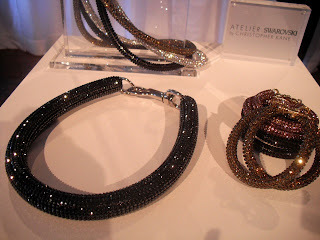 Those Christopher Kane black and bronze crystal chokers are stunning. You would have to keep that Hello Kitty statue in a safe with a security code. It's too much of a risk to get stolen! I've never been impressed by any crystal Hello Kitties. I dunno why! It's so weird because with anything else, I'm ok with it! I do LOVE LOVE LOVE the Christopher Kane necklace. Oh man. that's just gorgeous.